How do you spot the groom in a typical Indian wedding? 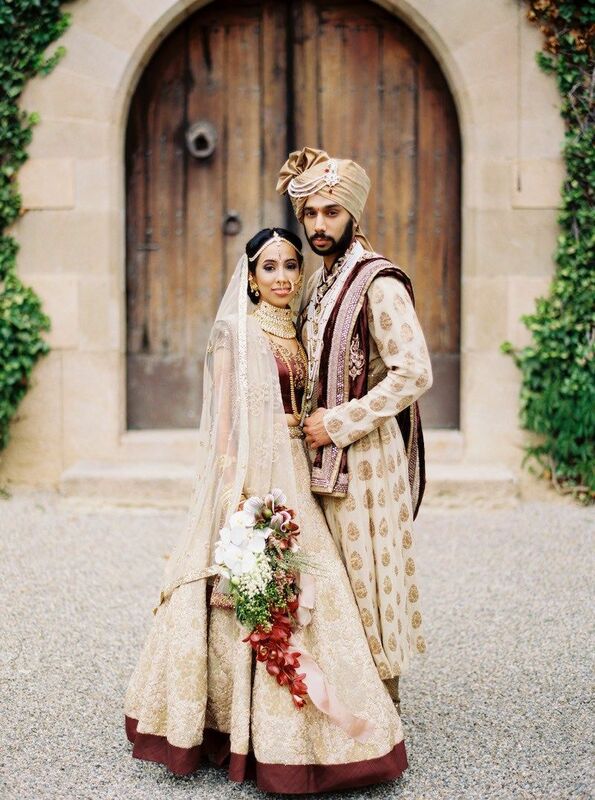 The perfect attributes of an immaculately turned out Indian groom are a richly embroidered sherwani, a stole worn around the neck, mojdis (traditional Indian footwear) and, a stylish safa or turban with a jewelled brooch or kalgi pinned in the front or a feather perched on the top.So here we are to ride you towards the Trending safas for Indian grooms. I groom, but it doesn’t take me a long time to get to what people see. Of the entire look, the safa or the turban is what grabs the attention instantly. It is an important part of not only the groom’s attire but also that of his father, uncles, cousins, best man and other immediate male relatives. However, the groom’s turban is naturally far more special than the rest. We at Wedamor love seeing a well-styled groom who’s not afraid to take a risk! So here are some tips for a trending safas that could make you an ever stylish Indian groom in 2017. 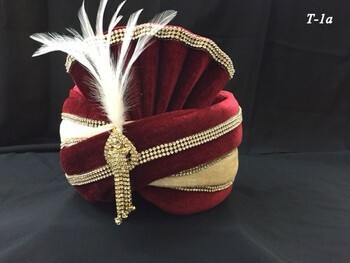 The importance attached to turbans is on account of the fact that Indian kings and princes considered their crown and turban as a symbol of their pride. It has always been considered a symbol of self-esteem for Indian men. In many rural parts of India, a turban is part of the everyday attire of men even today. However, in the rest of the country turbans are now worn only at weddings, making it all the more necessary to make it special. The tradition is pan-Indian, as grooms from all Hindu, Sikh, Muslim or Jain communities don a safa on their wedding day. 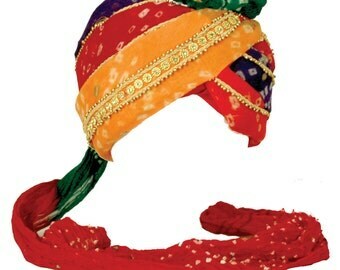 The style and design of the headgear for the groom can differ from one community to another though. But the safa is always important therefore it is always to go with the trend. Hence wedamor provides ideas for a trending safa for Indian grooms in 2017. Traditionally, a safa is a simple red or pink coloured cloth in cotton, either plain or of tie-and-dye pattern, tied around the head. But with the changing times and increasing lavishness of Indian weddings, this symbol of pride has gone through some major transformations thereby making it not only the symbol of ‘shaan’ but is also seen as for whether it is trending or not. Trending safas for Indian grooms in 2017 need to be synchronised with the entire attire. The best way to make your safa look great is to balance it with your outfit. You can easily do this with the choice of fabrics. Team the traditional, simple monochrome safa in cotton or raw silk with an elaborate or heavily embroidered outfit, and go for a richly embellished safa in opulent fabrics like silk, brocade or satin for a relatively simpler outfit. With a heavy safa, you can go all out and add as many accessories or embellishments as you want. Intricate embroidery on the front, beads, crystals, and much more! This adorned with a dangling chain of pearls, and a delicate yet proud feather, makes your safa look regal. The kalgi or jewelled brooch can be pinned in the front to add to the royal look. These brooches are usually studded with colourful stones or semi-precious gems, pearls, kundan and crystals. The concept of “one size fits all” is passé. There are designers who specially design and create special safas for grooms according to their sizes and preferences. When it fits snug on the forehead, without leaving any loose gaps, it adds to the entire look. That is why more and more Indian grooms are opting for customised safas. In many communities, it is still considered ominous for the bride and the groom to see each other before the wedding. This is why safas have strings of flowers hanging at the front, covering the groom’s face during the ceremonies. You can also choose pearl strings instead of flowers if you wish to go that extra mile to look ultra stylish. Quite a useful tip among our trending safas for Indian grooms know? There has been way too much said already about the trending safas for Indian Groom in 2017 but here is another important guideline the groom needs to consider. Coordinating outfit colours between the bride and groom is always important for the wedding couple to look more attractive and balanced. While with most of the people the general tendency is to match outfit colours together, you may want to put a bit of a thought into contrasts as well. The best way to match outfit colours is to contrast the safas with the bride’s lehenga. If the safa is already selected one could match the jewellery i.e. kalgi with the lehenga. 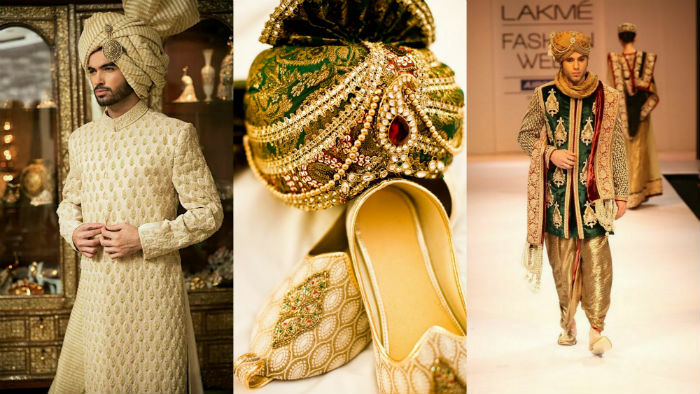 So, do let us know about our trending safas for Indian grooms in the comments sections by giving your ideas and suggestions and do subscribe and share if you liked the post. I am a young, confident, dynamic, full of energy B.Tech student.Though I am from the technical background I have great interest in writing as well. Apart from writing, basketball and dancing are the fields I have a great interest in. Exploring different fields is my way of living life.I'm still exploring in a lot of ways.I don't know myself completely.